Every plant has a Latin and a common name, both of which come with a story. Come find out how some plants get their quirky callings! Sometimes naming can be straightforward. The fruit of this African tree dangles as an image that may look familiar to you… hence its name: the sausage tree! For corndog enthusiasts (if you exist), this is the tree of dreams. What you see in Figure 1 is actually the fruit of the tree, which can grow up to 2.5 feet long and opens up to a beautiful, blood red flower. Here’s the kicker: these sausage-like structures cannot be eaten! They act as a laxative and cause painful ailments around the mouth. Don’t’ trust the misleading name for this troublesome tree! This plant is known as the sensitive plant, the touch-me-not, or the shameplant, and not because it’s touchy about name-calling. 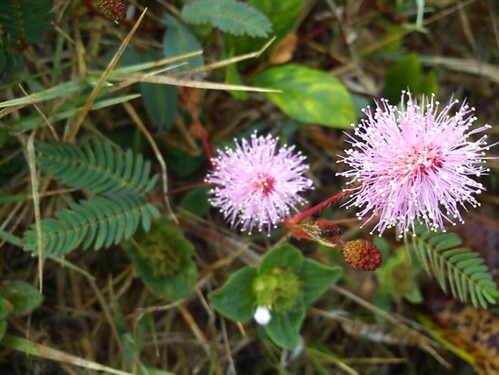 Although this flower is as bright and ebullient as a firework, the sensitive plant derives its name from its leaves’ unique response to touch. By rapidly reducing the pressure of its cells, the plant is able to quickly fold up its leaves away from what it’s touching. If the stimulus is strong enough, the sensitive plant will even drop an entire branch. Although this movement is energetically expensive, any herbivore hunting the forest floor for a snack may get a startling surprise when the leaves of the touch-me-not “disappear”. This is one plant true to its name: medusahead. 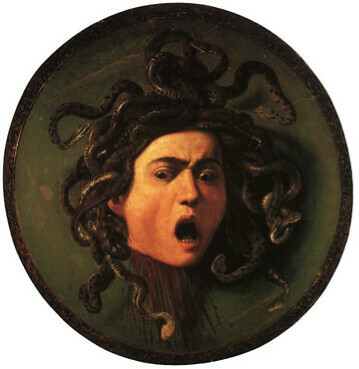 The tufts of this Mediterranean grass resemble the threatening snakes slithering from Medusa’s head. 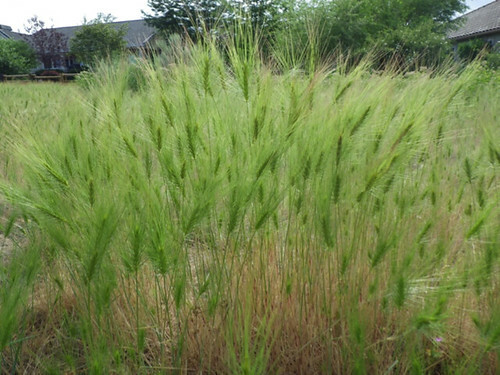 Here in the U.S., you can find medusahead invading grasslands of the west. Each individual “snake” of a flower produces a minimum of 20 seeds, making it a fierce reproductive competitor against native species. Thus, medusahead has a double meaning: both the appearance of the plant and its monstrous ability to spread across grassland ecosystems. 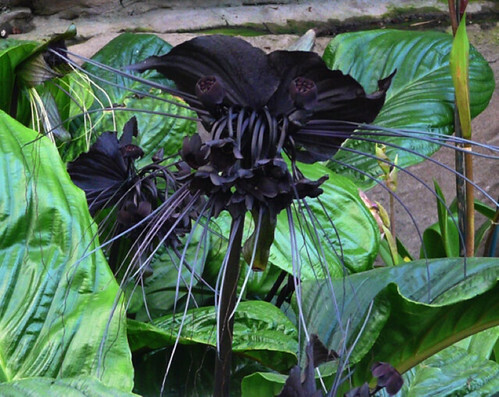 Tacca chantrieri, otherwise known as the black bat flower, can be found throughout Southern Asia. The authors kept this plant’s name simple, although the flower is most certainly not. The spindly, almost translucently black leaves mimic the wings of a bat. Long, whisker-like structures, which are actually additional specialized leaves, branch out underneath the small budding flowers of this unique plant. Just as bats can be elusive against the night sky, this plant species is quite rare in the tropics of Asia. Here is a slightly more romantic story of a plant you may be more familiar with: the forget-me-not. These are incredibly small, but beautifully colored flowers found along streams across North America. 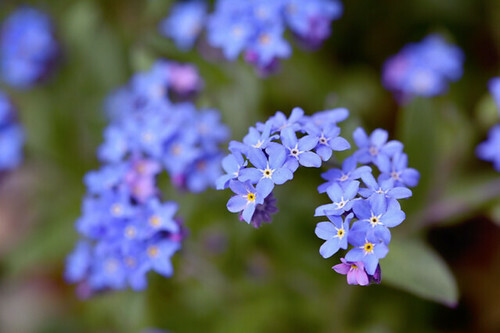 The supposed tale of the forget-me-not is that someone picked these flowers for their lover shortly before falling to their demise in a river, calling back “Forget me not!”. Although this is a myth from long ago, we have embraced the common name of this flower, using it to represent love and commemoration. From practical to poetic, each plant species is christened with a name aiming to ring true to its character. So, how well does your name fit your life story? Feel free to share in the comments below, or check out this other TLS post for more amazing plant stories! Joffe, Pitta. “Kigelia africana.” South African National Biodiversity Institute, August 2003, http://pza.sanbi.org/kigelia-africana. “Mimosa pudica.” Wikipedia, June 2018, https://en.wikipedia.org/wiki/Mimosa_pudica. “Taeniatherum.” Wikipedia, March 2018, https://en.wikipedia.org/wiki/Taeniatherum. Stannard, M.E. “Plant guide for medusahead (Taeniatherum caput-medusae).” United States Department of Agriculture, August 2010, https://plants.usda.gov/plantguide/pdf/pg_taca8.pdf. “Bat Flower.” University of Florida Gardening Solutions, October 2013, http://gardeningsolutions.ifas.ufl.edu/plants/ornamentals/bat-flower.html. “Myosotis scorpiodes.” Wikipedia, April 2018, https://en.wikipedia.org/wiki/Myosotis_scorpioides. “The Forget Me Not Flower: Its Meanings & Symbolism.” Flower Meaning, 2018, http://www.flowermeaning.com/forget-me-not-flower-meaning/. « Human Eye Structure Makes No Sense…Or Does It?